Enjoying the final days of grooming at the Mt. 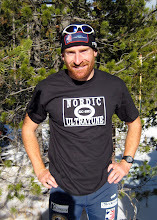 Bachelor Nordic Center. The Mountain did a great job of prepping the trail each day and managing the snow through stockpiling and plowing to last as long as possible. After a solid 10 days on snow I returned to the Methow to work on technique with Scott and enjoy a few recovery sessions. After years of hearing about it I finally got out to enjoy the Loomis Loop, a 52 mile ride in northern Okanogan county. I am looking forward to heading home to Minnesota but not without one last run in the mountains. Chad and I ran and scrambled up the ridge near Mt Robinson. We had hoped to go to the peak but there was still quite a bit of snow and I figured it we made the trip more than 5 hours it wouldn't really be a recovery session.